An event meant to showcase Kazakhstan’s progress shows its dark side. One sunny afternoon in early June in Astana a bureaucrat is fired. When a bureaucrat is not transferred to another position, he must have done something wrong. In what seemed an emergency move, the chairman of the National Company Astana EXPO 2017 Talgat Yermegiyayev was removed, replaced on June 11 by the current mayor of Astana, Adilbek Dzhaksybekov. That left the public to wonder who was going to be the next mayor of the capital, now that Dzhaksybekov was in charge of global exposition that is supposed to attract millions of visitors to Kazakhstan in 2017 and is said to cost $3 billion. The government quickly informed the press: “Dzhaksybekov will maintain his position as mayor of Astana” was the awkward title in every newspaper. One more day passed and the mystery was resolved: Yermegiyayev was being held in custody after being accused of embezzlement and abuse of office. The misappropriation of funds involves sums that had been allocated via the sovereign wealth fund, which has a stake in the company in charge of the EXPO. This is a huge corruption case for Kazakhstan, especially given who was involved. Yermegiyayev’s father, Amangeldy was a powerful figure in the early years of independent Kazakhstan. The family has been close to President Nursultan Nazarbayev since the early Nineties. The Yermegiyayevs have stakes in several business ventures that involve Dinara Nazarbayeva and Timur Kulibayev – Nazarbayev’s daughter and son-in-law, respectively – and are co-owners of the famous Rakhat Towers in Almaty, which were once the symbol of ex-son-in-law Rakhat Aliyev’s influence in Kazakh business. Kazhymurat Usenov, former head of construction for Astana EXPO 2017, was also been kept under house arrest for his role in the embezzlement of 214 million tenge (1.15 million dollars) while heading Southfork, a construction company that had won a public tender. Usenov had resigned from his position in Astana EXPO 2017 in late 2013 after his son Maksat killed a pedestrian while driving in Almaty. Maksat Usenov, who had had his license suspended in February 2013 for driving while intoxicated, was given peculiar treatment as he was able to reach an agreement with the family of the victim. Maksat Usenov’s case unleashed the rage of many local citizens, who were convinced that a solution was only possible for him because of his family ties. These two cases triggered a storm around Kazakhstan’s EXPO project. The main critics used the occasion to bash the event, seen as a cash cow for the bureaucrats involved. Now even Kulibayev, the president’s son-in-law and a powerful businessman in his own right, had harsh words for the bureaucrats who were caught. “They should be punished because of the damage they caused to several entrepreneurs,” he said, without explicitly mentioning the EXPO case. On June 19, as he was uttering these words, Sulambek Barkinkhoyev, managing director of the Astana EXPO 2017 company, was arrested for corruption. While the West is growing wary of major events in the wake of the FIFA World Cup mess, the scandal in Kazakhstan comes just a few weeks after the opening of EXPO Milano 2015, which has its own problems, including chronic delays in the construction of the pavilions and corruption cases that emerged in the months prior to the event. Last year and this, politicians and managers have been arrested in Italy in cases involving charges of embezzlement and abuse of office for the assignment of tenders. 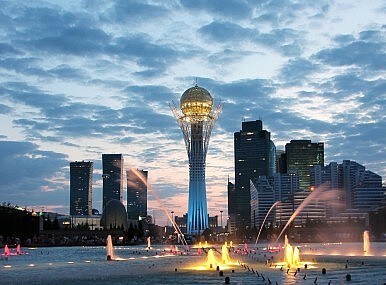 Kazakhstan wished to avoid that fate, speeding up the completion of new buildings and hiring international consultants. Astana’s landscape is still dotted with cranes and construction runs through the night. With the arrests, the summer cleanup seems to have already begun. The court sentences will soon tell us if and how power relations have changed among the elite who run the country. Restructuring of Kazakhstan's Banking Sector ContinuesKazakhstan’s Top Party Picks President, Meanwhile the Youth Debate the FutureHow Can Kazakhstan Revitalize Its Civil Society?Kazakhstan's Teachers: Underpaid, Overburdened, and UndervaluedSnap Presidential Elections Called in Kazakhstan. But Why?